The sensitivity of the human eye to light of a certain intensity varies strongly over the wavelength range between 380 and 800 nm. Under daylight conditions, the average normal sighted human eye is most sensitive at a wavelength of 555 nm, resulting in the fact that green light at this wavelength produces the impression of highest �brightness� when compared to light at other wavelengths. 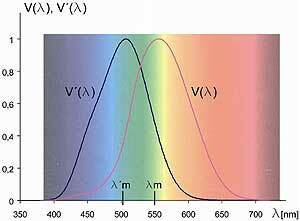 The spectral sensitivity function of the average human eye under daylight conditions (photopic vision) is defined by the CIE spectral luminous efficiency function V(λ). Only in very rare cases, the spectral sensitivity of the human eye under dark adapted conditions (scotopic vision), defined by the spectral luminous efficiency function V�(�), becomes technically relevant. By convention, these sensitivity functions are normalized to a value of 1 in their maximum. As an example, the photopic sensitivity of the human eye to monochromatic light at 490 nm amounts to 20% of its sensitivity at 555 nm. As a consequence, when a source of monochromatic light at 490 nm emits five times as much power (expressed in watts) than an otherwise identical source of monochromatic light at 555 nm, both sources produce the impression of same �brightness� to the human eye. Fig. II.13. Spectral luminous efficiency functions V(λ) for photopic vision and V�(λ) for scotopic vision, as defined by the CIE.